For meetings in Bali , Swiss-Belhotel Rainforest provides spacious rooms for guests to organize their business meetings or banquets. A Ballroom for up to 500 guests in theatre style arrangement and can be split up into 3 smaller meeting rooms for conferences, seminar and meeting in Bali. Swiss-Belhotel Rainforest is also the perfect venue for weddings. The Ballroom can accommodate 200 guests for a sit down dinner and is very well suited for wedding receptions and other celebrations Whether it is a civil ceremony or an exclusive use wedding – our team of dedicated wedding co-ordinators are on hand to help you with all your wedding arrangements to make your day memorable. Swiss-Belhotel Rainforest in collaboration with House of Leonardo. Find out the inclusions here! A perfect place to host your corporate needs in Bali! Swiss-Belhotel Rainforest - Kuta is a 4-star international hotel in Bali that provides a high quality standard of services and facilities. The hotel is ideally located in the central business and Bali Tourism district of Kuta, only 10 km from Ngurah Rai International Airport. 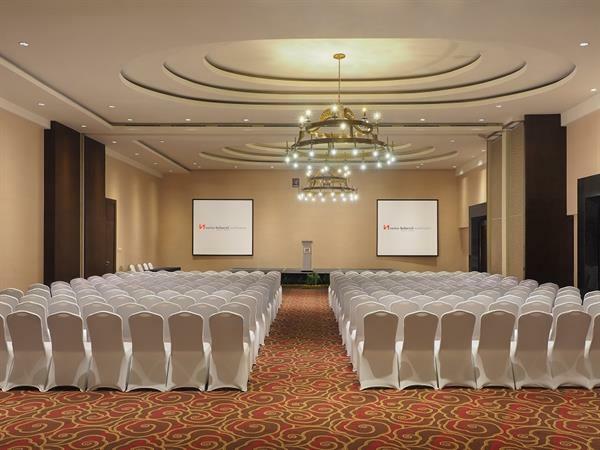 The hotel has a Ballroom for up to 400 guests in theatre style arrangement and can be split up into 3 smaller meeting rooms for conferences, seminars and meeting in Bali.